Simultaneous equations are usually a nightmare for the average secondary school student: they cannot or will not do them. I was no exception. I remember, however, realising what they were and how they worked years after leaving school and then I thought, why on earth does anyone have a problem with them. 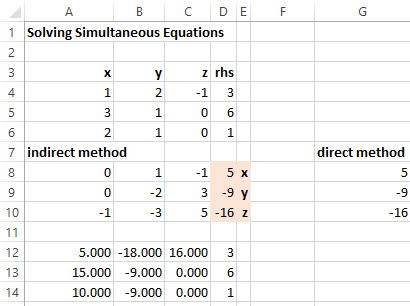 If you know SEs you know there are several ways of solving them and I am not a mathematician so I am not going to explain Cramer’s rule, matrix algebra or even substitution … just show you how Excel can help. 5 + 3*1 = 8 … 5 + 3 = 8 … 8 = 8 … QED! Try it yourself for equation (2) if you wish. 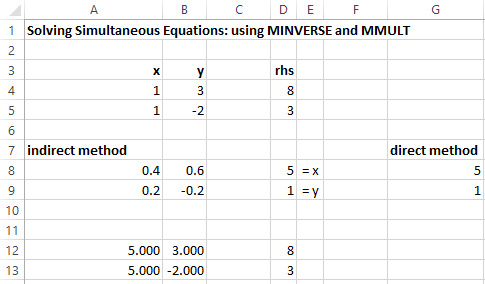 Direct Method Using the two array functions MINVERSE() and then MMULT() together in the form =MMULT(MINVERSE()) .. this is essentially a single cell solution per variable. The names indirect and direct are my own and I am classifying them as different methods although in reality they are not! 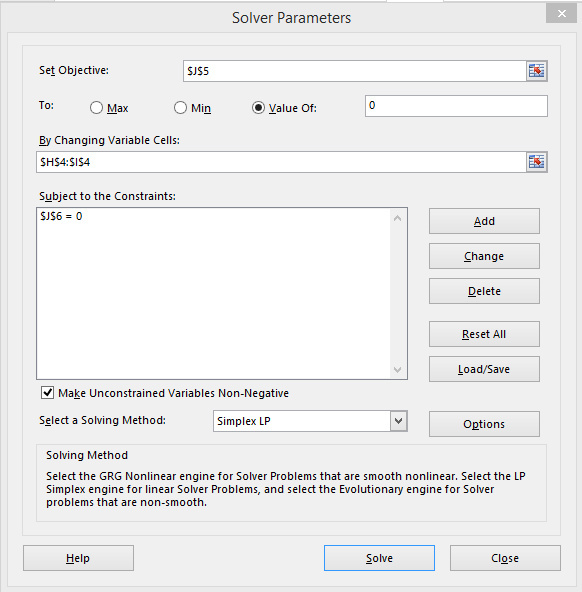 SOLVER solution: using the SOLVER add in to provide the values for the variables. This is a two variable set of simultaneous equations and I have left column C blank to allow us to develop three variable examples. All you do is type in, hard code, the entries in the range A3:D5 in this example. The range A8:E9 includes the solution using firstly the MINVERSE() array function and then the MMULT() array function. The range A12:D13 contains the Proof area in which we test the solution that x = 5 and y = 1. Select the range A8:B9 and keep it selected then type =MINVERSE(A4:B5) then press Control and keep it pressed, press Shift and keep it pressed as well then press Enter, now let go of all three keys I will call this CSE from now on!). And you should get the inverse matrix that you see in the range A8:B9 … it if doesn’t work, do it again carefully and if it still doesn’t work, check your typing. If it still doesn’t work, download my example file! The MMULT() array function gives you the answer, as I have labelled here the first number, 5, is the value of x and the second number,1 , is the value of y. Carry out the proof to make sure your answers are correct … don’t look at my solution in my Excel work book until you are happy with your own! There you are, straight to the answers, x = 5 and y = 1. And prove your method and answers! You’ve now got a template for solving any two variable set of simultaneous equations where there is a solution. Many students can solve two variable simultaneous equations but then get stumped by three and more variables. If I were you and you need to learn and apply rules like Cramer’s rule in full, find the solutions here then work backwards to use the more formal methods … that’s a top tip for you! You can see I have set it up in full for you and have colour coded the solutions since that part of the work sheet is getting a little crowded now. BEFORE you look at my solutions in my work book, try to work out how to solve a three variable simultaneous set of equations yourself. Make it work, make sure it works before you move on. In my workbook there are additional questions for you to work on. The link to SOLVER will appear in the top right hand corner of the Data tab just click on it to start it. We do two things here: first the mathematics and then the Excel. =8-3*I4-H4 … actually I have been a bit inconsistent there so feel free to reorganise that cell as you wish. SOLVER will have found the answer to this question when it puts the correct values in cells H4 and I4 in this example and J5 = 0 and J6 = 0 … exactly in line with the work we have just done. Enter what you see there in the various boxes in case I emptied them before uploading the file! Ensure you understand what I have done because you are going to do it yourself in a minute for different and bigger questions: three and four variables. Now click Solve and SOLVER should tell you it has found a solution, put the solution in H4:I4 AND shown that J5 and J6 are both = 0. THAT is your answer. QED x = 5 and y = 1. You have already solved this problem but use SOLVER as well, for practice. BEFORE you look at my solutions in my work book, try to work out how to solve tis problem using SOLVER yourself. Download my Excel file from here fon_simult where you will see these questions and four variable simultaneous equations together with a problem that has no solution … so you can see what happens if the teacher or lecturer gives you a problem that cannot be solved. You will see that formula in the four variable questions but you an just as easily use it for the two and three variable questions as well. That’s it! Hope this works for you! can you check if i am wrong? 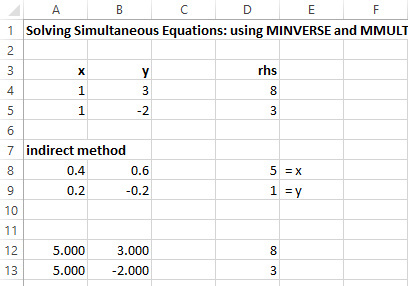 Simultaneous equations relate to the situation where we set up two or more equations in which all instances of the X variables have the same value as each other, all instances of the Y variables have the same values as each other and so on. That is why they re called simultaneous because everything is equal at the same time!